Traveling with Engineers in Action can be a life-changing experience. To share these exciting upcoming opportunities with its volunteers, EIA recently hosted a live info session where Bolivian staff outlined key information for anyone interested in visiting an EIA community this fall. The first trip, planned for mid October, will be to the village of Timusi. The second, scheduled for later in the fall, will be to the village of Eucaliptos. Applications are currently open for both trips and available on the opportunity pages. Volunteers get to enjoy the perks of traveling with indigenous staff who handle the majority of logistics, such as translation, lodging and transportation. Learn more in the on-demand webinar below, or apply now with the form below! Engineers in Action’s 2016 Annual Report was released this week, giving donors, volunteers and staff a comprehensive recap of EIA’s growth and accomplishments over the last year. Key highlights include an expansion into Ecuador and new programs that will further allow EIA to have a valuable impact on the lives of thousands in rural South America. View the Annual Report below or go to engineersinaction.org/ar2016. Researchers from Saint Francis University, the University of Oklahoma, and Pennsylvania State University working with Engineers in Action have found that exposure to trace metals from potatoes grown in soil irrigated with waters from the Potosi mining region in Bolivia may put residents at risk of non-cancer health illnesses. The world’s largest silver deposit lies in this region, and exposure to mining pollution from contaminated irrigation waters worries residents. ‘In this high mountain desert, water is a critically precious resource and the use of metal-polluted waters for irrigation may have substantial detrimental impacts on the lives of subsistence farmers,’ said William Strosnider, who is leading continued work at the site from Saint Francis University. These findings are of concern given potatoes are the primary dietary staple in these communities. The lack of water for quality irrigation this arid region forces farmers to use contaminated waters, leading to health risks from contaminated potatoes eaten locally or shipped to outlying areas. For children, ingestion of arsenic through potatoes was 9.1 to 71.8 times higher than the minimum risk level and ingestion of cadmium was 3.0 to 31.5 times higher than the minimum risk level. The hazard quotient is the ratio of estimated specific exposure to a single chemical over a specified period to the estimated daily exposure level at which no adverse health effects are likely to occur. Hazard quotients about 1 suggest the possibility of adverse non-cancer health risks. The minimum risk levels are established by the U.S. Agency for Toxic Substances and Disease Registry. ‘Our findings allow the research community insight into the potential human and environmental impact that vast active and abandoned mining operations may pose all across the high Andes,’ said lead author Alan Garrido, of the Centro de Investigacion en Ciencias y Recursos GeoAgroAmbientales, CENIGAA (Neiva, Colombia). This study was funded through a collaboration with Engineers in Action, a non-profit entity dedicated to improving the availability of low-cost high-impact engineering projects for clean water in developing countries. Engineers in Action is located in Tulsa, Oklahoma, and La Paz, Bolivia. The Center for Restoration of Ecosystems and Watersheds at the University of Oklahoma executed the study under the guidance of program Professor Robert Nairn. A paper on this research titled, ‘Metal-contaminated potato crops and potential human health risk in Bolivian mining highlands,’ has been published in the scientific journal, Environmental Geochemistry and Health, at doi: 10.1007/s10653-017-9943-4. Engineers in Action is making a call for volunteers to join a summer travel team! To view all of the programs currently seeking volunteers, click here. Traveling with Engineers in Action is a life-changing opportunity. Be a part of the global effort to end water poverty, encourage healthy families and increase local capacity so that all people, everywhere, can flourish. Join a trip today! Engineers in Action received approval today from EWB-USA for a new partnership with its Santa Barbara Ventura Professionals chapter. The partnership will bring volunteer engineers from the local chapter group to El Muyuyo, Ecuador for a multi-year program to research, design and implement quality of life improvements in a local village recently traumatized by earthquakes. Engineers in Action will coordinate all logistics and manage the program, while individuals from the Santa Barbara Ventura Professionals group will volunteer their time to help EIA staff research, design and implement a solution. EIA, a 501(c)3 organization that has previously worked solely in Bolivia, made the strategic decision to expand its current operations into Ecuador in 2016, launching its first Ecuadorian program earlier this year. The organization impacted the lives of more than 4,500 people in 2016. To support the organization, sign up to volunteer at engineersinaction.org – no special skill required – or donate to help the organization cover fees and materials at engineersinaction.networkforgood.com. Today, caring individuals around the globe will come together to raise awareness of the global water crisis, and raise support for the organizations working to eradicate the many diseases, burdens and threats tied to the issue. To learn more about the United Nations-sponsored World Water Day efforts, go to worldwaterday.org. A staggering 663 million people around the globe lack access to water near their home, spending a ridiculous amount of time trekking to and from distant water sources carrying buckets and jugs of water back to their families. This burden most often falls to women and children, especially young girls, who miss school to help gather water. Once the water is secured from a distant source, the family then uses the water for a multitude of tasks, including drinking and cooking. Unfortunately, this water is most often contaminated, likely causing any number of water-borne illnessesand possibly even death. 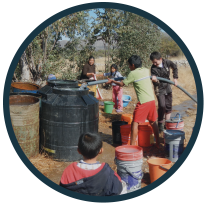 Plus, there typically is not enough water to meet all of the families’ needs, such as watering crops. Without water to irrigate the crops, the family consumes a limited diet that lacks the diversity needed for proper nutrition. As you can see, the adverse effects of this global epidemic continue on with a ripple effect that can only be reversed one way: make clean, safe water easily accessible to all. 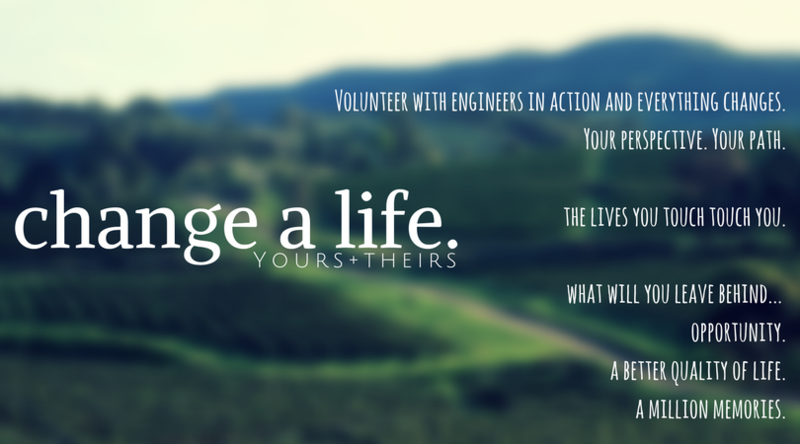 With your help, Engineers in Action can help make that change. Your support allows us to send more teams to more villages to build more water wells and tanks that will provide safe water to more schools, homes and communities. Engineers in Action can change lives. If you follow EIA’s Facebook page or frequent our website, you’ve seen Ruben. 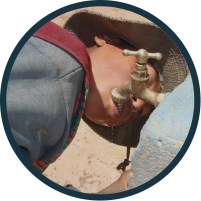 He’s the sweet 8-year-old boy grinning adorably in our World Water Day graphic and on engineersinaction.org‘s home page. Ruben is actually kind of shy at first (not surprising), but quickly turns into quite the ham (also not that surprising). He is kind, caring, a good big brother and extremely nimble on mountain-side paths high in the Andean mountains. Ruben is one of the many children EIA volunteers and staff have the absolute joy of meeting while visiting the remote villages where we work. Like many of the children we meet, Ruben doesn’t care what language you speak. He giggles as he leads the way, rambles on about things, oblivious to your utter lack of understanding. Children like Ruben are so quick to welcome visitors and quick to try new things, like washing hands or using a water pump. They are our first friends. I’m very proud to work for an organization that the indigenous people trust. Most often, these villages reach out to us for assistance. In these rural areas, word of mouth is king, and I’m ecstatic to see Engineers in Action grow – not due to our infiltration of secluded communities – but due to the relationships we’ve built with our ongoing program communities, and our ability to live up to our promise: we’re here for the long haul. They come to us with a need, we help them find a solution and we stay involved until they don’t need us anymore. It’s that simple. So, when I meet children like Ruben, I think about him many years from now, serving as his village’s mayor and meeting with Engineers in Action about what’s next. What can we do next to help better their lives? To help build their capacity as a community? To give his children an even brighter future? To make this a reality, it’s my job to build Engineers in Action into an organization that can stand the test of time, just like the tanks and wells we install. 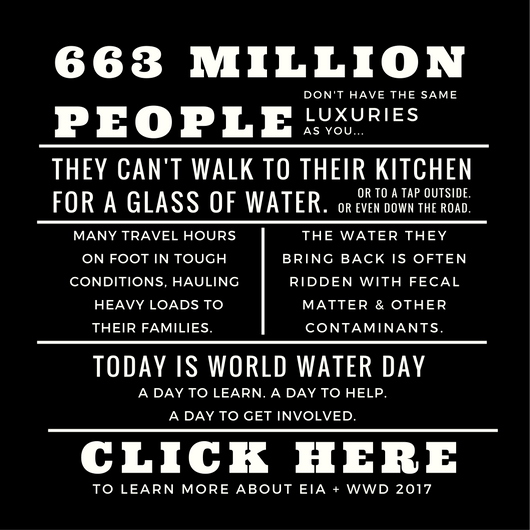 In honor of World Water Day 2017, I personally ask that you set up a recurring donation – of any amount – to provide EIA with monthly, quarterly or annual support. This type of funding stream allows us to better plan for our future, and for Ruben’s. Thank you for all you’ve done and continue to do for our organization! We would be lost without you. Send this to your contacts with a personal note about why you care, why you donated or why you support EIA! Find us on Facebook and share one of our posts, or use your own preferred social platform, to let others know about World Water Day! Volunteer to travel with us for a life-changing trip to rural South America! Turn off the water while you’re brushing your teeth, use what’s left in that water glass on your nightstand to water your plants, cut your shower time down or check this list for 100+ other ways to help conserve water. No matter the size, every donation makes a big impact on how many people Engineers in Action can help. Plus, our World Water Day matching fund means every $1 you donate is $2 to support EIA!